The annual Sheep is Life Celebration teaches new generations about all forms of fiber arts, Navajo heritage, pastoralism and sustaining the Navajo-Churro Sheep breed. 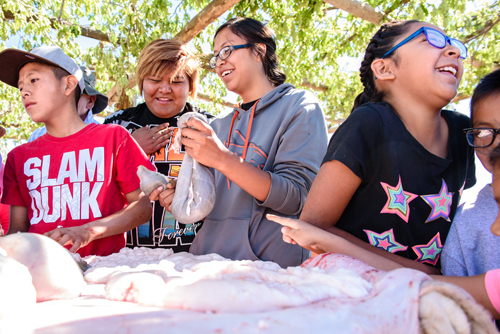 Here, Navajo children assist in preparing a Navajo-Churro lamb at the festival. In New Mexico, for many in the Navajo Nation, the Navajo-Churro sheep are at the center of their hearts. And finding ways to promote and sustain the health and revitalization of sheep is a core component of the work of Diné be’iiná, Inc. With support of First Nations Development Institute (First Nations), and a focus on strategic planning and capacity building, this 28-year-old organization has achieved new levels in ensuring that the valued sheep continue to remain in their hearts, culture and lives. The mission of Diné be’iiná is to restore the balance between Navajo culture, life and land and to preserve, protect and promote the Navajo way of life. Diné be’iiná means “the way that we, the people, live,” and much of that heritage is derived from the Navajo-Churro sheep, says Diné be’iiná Director Aretta Begay. The mission of Diné be’iiná, a 501(c)3 nonprofit organization since 1991, is to restore the balance between Navajo culture, life and land and to preserve, protect and promote the Navajo way of life. Since its founding in 1991, Diné be’iiná has kept the spirit of sheep alive by working with Navajo shepherds, providing education to the community, and fostering an economy based on wool and meat. Key to this work has been the establishing of spin-off programs that introduce people to the culture and industry of sheep raising, connecting sheep producers, weavers, wool processors and fiber artists. 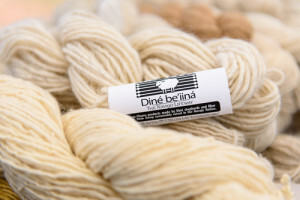 Diné be’iiná also has multiple core programs, including the Sheep is Life Celebration festival, Sheep to Loom weaving and fiber education classes, and a “Lamb Presidium,” which nurtures a market for wool and meat, creating a viable income for shepherds and weavers. Funding comes from program fees, donations and grants, including from First Nations. In 2017, the organization received a grant from First Nations’ Native Agriculture and Food Systems Initiative for a Sheep to Table project, in which apprentices were identified and trained to gather, document and share their knowledge of wild, edible plants and shepherding practices. This knowledge was vanishing with every generation, jeopardizing the ability of Navajo families to understand the value of the sheep and its role in their survival and culture. According to Begay, this involves everything related to the sheep, including how the sheep are raised, where they are raised, and the spiritual connection to sheep before the meat even reaches the table. With this type of funding, Diné be’iiná has been able to serve a large portion of the Navajo Nation in New Mexico, which has over 300,000 tribal enrollees. The organization is the only Navajo or tribal group doing this type of work, as other groups will feature the sheep during specific celebrations or events, but not on a full-time basis. 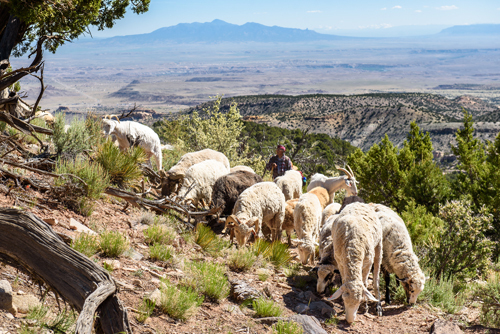 Advisory Board Member Roy Kady seasonally hosts a “trailing of the sheep” hike for community members to understand the tradition of Navajo shepherding. At the same, time, Diné be’iiná has heard increasing interest from the community about sheep and even getting starter flocks. Yet Begay says, many people still don’t know the traditional ways about the tending of sheep or the wool or fiber. To achieve its mission of promoting and protecting the Navajo way of life, Diné be’iiná leaders knew more would have to be done to ensure knowledge was being adequately passed down from elders to new herders. This is where strategic planning and capacity building came into play. The organization sat down to figure out strategies to build on its history and advance its mission. It was already conducting the spin-off groups across the Navajo Nation, but to meet the increasing interest, they had to question: Could these groups have a greater impact? Diné be’iiná realized that by strengthening the spin-off groups through education, training and mentoring, they could build the capacity of each group. Diné be’iiná would be able to deliver more programs, sponsor additional groups, and meet greater demands for outreach from schools and other community organizations. The organization applied for and was granted funding through the First Nations Native Arts Initiative for a project it calls Sheep to Loom: Retaining and Promoting Traditional Navajo Fibers Arts. To maximize the effectiveness, and as part of the technical assistance made possible through the grant, Diné be’iiná engaged with an organization called Melvin Consulting to further define its strategic approach. The organization used a process that involved reviewing its history, documenting trends in operations, and determining the factors that precipitate growth periods. Eileen Egan, a partner at Melvin Consulting, worked with Diné be’iiná. “It was illuminating to see the many ‘ah-ha’ moments when everyone took a step back to review their journey starting with their launch in 1991,” she says. 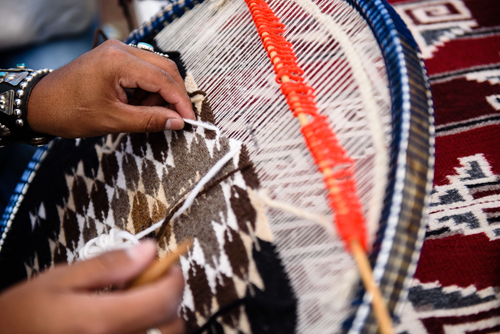 Teaching and sharing textile fiber arts is imperative in passing down the Navajo way of life. Pictured here is “Round Rug Weaving” by Antonio Chiquito, a Navajo weaver. With a strategic plan in place, the Implementing Sheep to Loom moved forward with several objectives. To start, Diné be’iiná set out to bolster the leadership capacity of its board of directors, volunteers and staff. This set the backbone of the project by training all involved on board responsibilities, budgeting and fundraising. The next objective was to identify three existing spin-off groups that were well-versed in Sheep to Loom activities related to fiber art, Navajo weaving and traditional wool processing. Each group was given technical assistance, leadership support, and capacity training to fine-tune and document these activities. Each group then identified an apprentice to initiate the Sheep to Loom concept. The three apprentices joined with key individuals from each spin-off group to form a mentoring team consisting of the group host, a master fiber artist, at least one traditional shepherd, and a project director. The team approach was chosen to create a culture of leadership and mentorship that would stay intact after the project ended. The organization fosters an entrepreneurship economy for sheep producers, weavers, wool processors and fiber artists. Pictured is hand-spun Navajo Churro yarn, one of the Diné Be’iiná products. Finally, through all of the training and mentoring, the Navajo way was upheld and fostered. “We recognize and acknowledge that Mother Earth provides for us and we have to live by that. We take care of the plants, the animals, and the language – we have to continue to talk about it and practice it,” says Begay. The project has been critical to the sustainability of the sheep and the culture, she says. True to the purpose of the Native Arts Initiative funding, the Sheep to Loom project will add to the long-term perpetuation, proliferation and revitalization of traditional artistic and cultural assets. And, true to the mission of Diné be’iiná, it will promote and protect the Navajo way of life. This entry was posted in NL10 by rblauvelt. Bookmark the permalink.